Hong Kong Tenpin Bowling Congress wishes to invite all members of the World Tenpin Bowling Association to participate in the Chinese Gold & Silver Exchange Society World Youth Championships, scheduled to take place at the 60 Brunswick Synthetic lanes, South China Athletic Association bowling centre in Hong Kong from August 6 to 15, 2014. Hong Kong is situated on the southeast coast of China at the mouth of the Pearl River facing the South China Sea. Covering an area of 1,104 square kilometres (425 square miles). 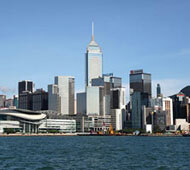 It comprises Hong Kong Island, Kowloon and the New Territories, which includes 262 outlying islands. At the core is Victoria Harbour, which separates Hong Kong Island from Kowloon and beyond that, the New Territories that runs up to the boundary with Mainland China. As well as making up the bulk of Hong Kong's land mass, the New Territories also incorporates 262 outlying islands, including Lantau where the airport is located. Hong Kong offers a host of memorable tourist attractions within its compact area, with The Peak, Victoria Harbour and the Giant Buddha among the most awe-inspiring. You'll be amazed by the diverse contrasts and close proximity of stunning cityscapes and soaring mountains, heritage sites and extensive green countryside. Whether you are a vacationer, nature lover or cultural explorer, Hong Kong can cater for your every desire. Discover the myriad things to see and do in one of the most diverse and exciting destinations in the world. For more information please visit the website of the Hong Kong Tourism Board at www.discoverhongkong.com. We are pleased to release the latest Bulletin 3. The Organizing Chairman and its Committee extends its utmost appreciation to the World Tenpin Bowling Association for its support, confidence and endorsement of HKTBC as host of this 2014 Championship.